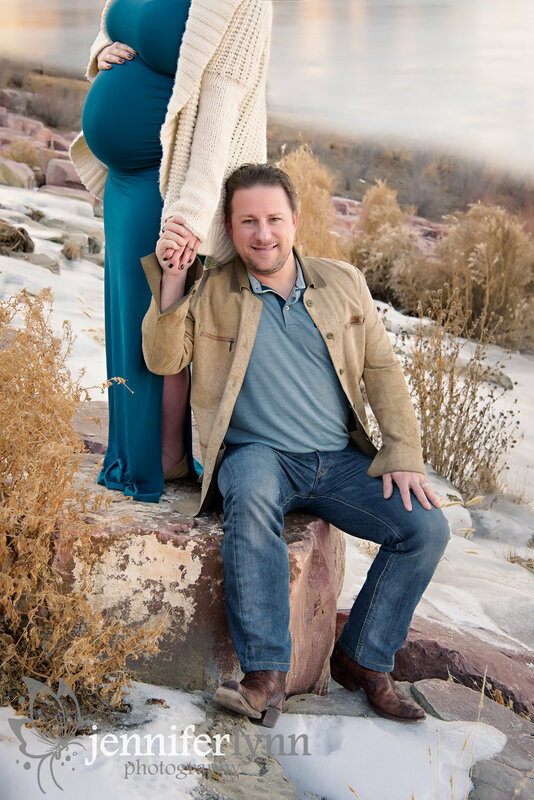 I got to meet Emily and Jeff yesterday for a quick maternity session while the weather was warm (well, warm for winter in Denver). Considering the temperature dropped 20 degrees since yesterday and has been below freezing since I'd say it was a true win to have both great weather and a gorgeous sunset. We were able to capture photographs in two locations, one with the gorgeous frozen waterfall and pond, which is simply stunning in winter. Then we snagged the beautiful sunset over the mountains as the sky turned pink and orange over Pikes Peak. This lovely couple just recently moved here from Arizona and have a lot of change in the works. New home, new city & state, and a new baby on the way whose gender will be a big surprise. I can't wait to meet their little one in February next year to preserve more memories for their family as it grows by one. I truly enjoyed spending the evening with them as they were full of fun, quick to make each other (and me) laugh, and I could just see the love they have for one another. I am so excited for them and the journey ahead as they anxiously await the birth of their little one. A big thanks for letting me be part of this special time in your lives and to have the opportunity to see you again when baby makes his/her debut! Thinking of booking a maternity session for your little bump? It's never too early to get on my calendar to make sure we time it right in your third trimester. Contact me today to book your session and be sure to take advantage of the maternity session discount when you also schedule your newborn photos.